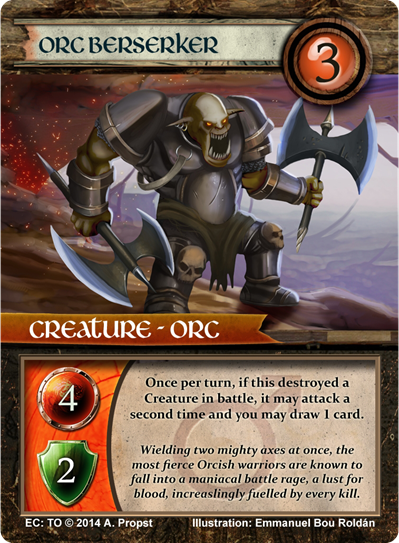 EC: Korlash gets an Army – Introducing ORCS into Elemental Clash! Dear readers, der friends and fans of the Elemental Clash CCG! 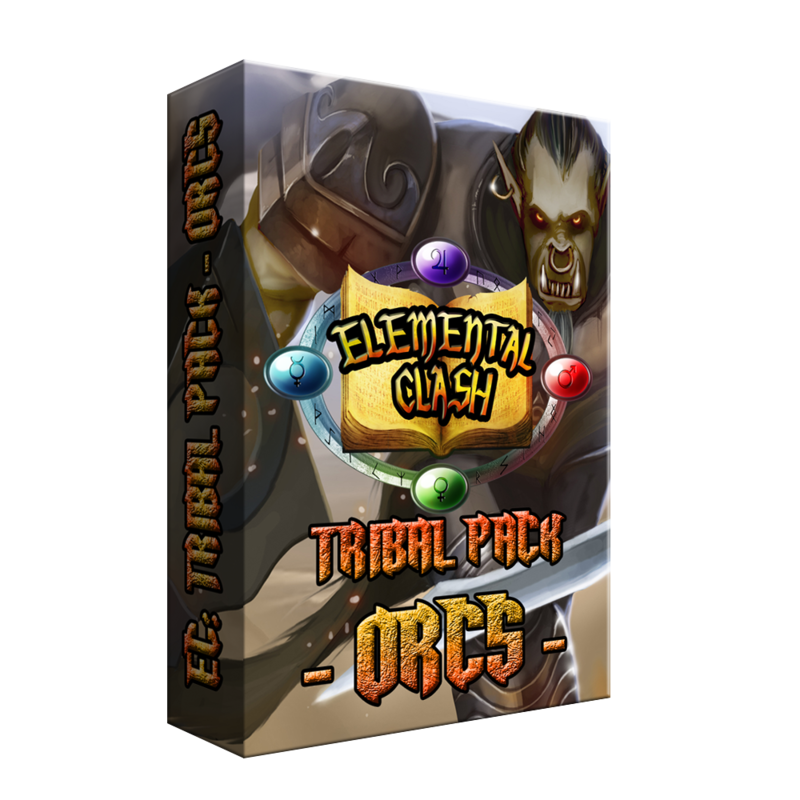 These days, as I am waiting for the very last artwork for Elemental Clash – Legendary Legacy to be completed, the box cover artwork, I am happy to present to you the first of many TRIBAL PACKS! The timing for the Orc art and cards which I am going to showcase in the following post could not possibly have been more perfect. Well, whilst Korlash is awesome in and off himself, with a powerful Static Ability shutting down so many decks, from Boon and Salvage decks over recursal and reanimation decks to decks using lots of Destroy-Effects. However, I was thinking that Korlash would be pretty lonely being the only Orc in the game without any minions of his own race to control and rule. This was simply begging for regular Orc Creature cards to be made and just as it happened I “came into” some kickass Orc Creature art, which I will be publishing in the form of the first of hopefully many “Tribal Packs” Mini Expansions which I will be trying to release every now and then. 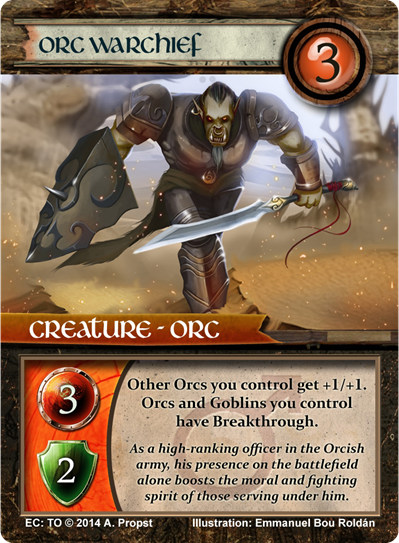 I have to note that each Tribal Pack will not only introduce a new Tribe, but also a new card ability – in the case of Orcs it will be “Breakthrough” – more on that later – and futhermore I will say it right away: I cannot give you a certain release date for this first 36 cards Tribal Pack all about Orcs. I will try to get all the art together, and I have a good part of it already through this obscure windfall I keep mentioning, over the course of a month and may well be able to release the Orcs Tribal Pack on in Mid-June to beginning of July 2014! But let’s take a look at the actual Orcs, brilliantly illustrated by Emmanuel Bou Roldán. 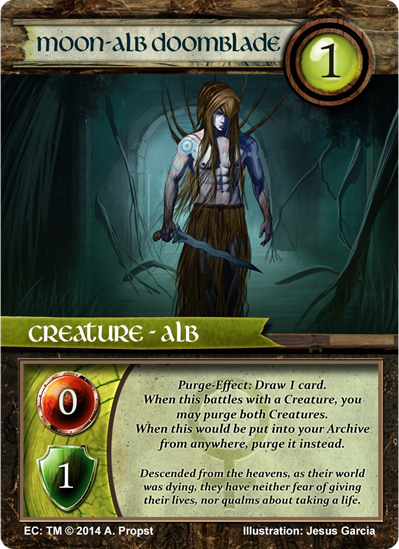 I will present them to you in the form of a deck, for which I am going to provide you with the decklist and follow up with my thoughts on the deck, illustrated with what we all want to see most – some great Orc card previews! These guys can be great to take out small blockers from a distance or kill off some high attack Creatures with 1 toughness such as Will-o-the-Wisp or the Dwarven Double-Axe Brigand without being killed himself. So you best leave your Elite Archers in the back row (DEF-Zone) and shoot some vulenerable targets from there. An awesome combo which I didn’t find the space for in this deck would be equipping Orcish Elite-Archer with Reaper’s Scythe. That would turn your lowly Orc archer into a true killing machine, as he would be take out any and all Creatures, no matter how much DEF (unless they have Immunity: Fire or cannot be targeted by Effects). 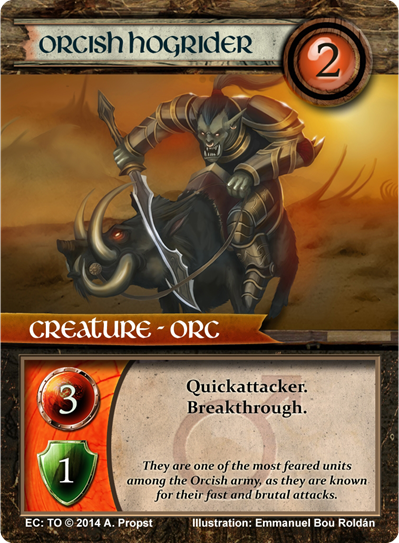 Orcish Hogrider has the classic Quickattacker Ability but also features the new Breakthrough Ability. Breakthrough simply means that if this Creature is blocked, excess damage will be inflicted to your opponent and cause him to discard cards from the top of their Spellbook. 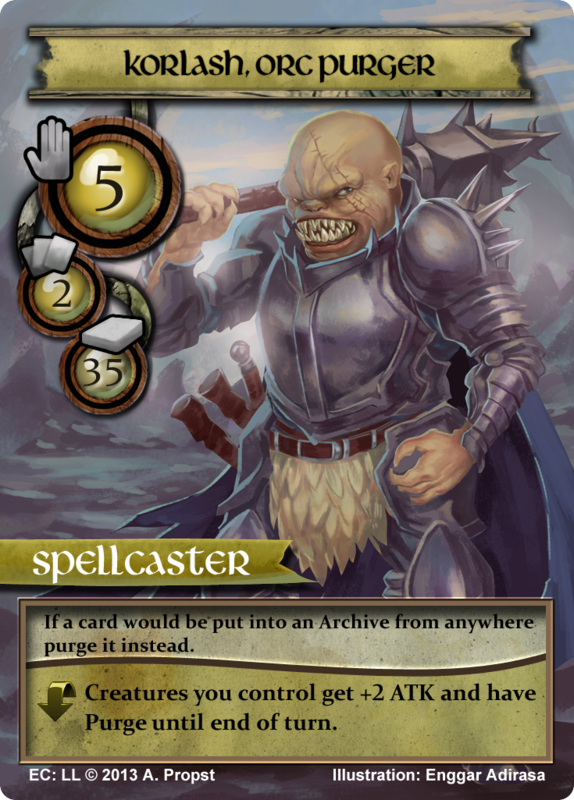 For example in the case of the above Creature, if Hogrider gets blocked by a 1 DEF Creature, the excess 2 damage will be inflicted to your opponent and they have to discard the top 2 cards from their Spellbook to their Archive – or if Korlash is stil unflipped/face-up, they’d be sent right to the Purgatory. Pretty useful and awesome ability, Breakthrough that is! Well every army needs high-ranking officers, so here you have the Orc Warchief, who not only boosts the stats of all other Orcs you control by +1/+1, but also gives all of them, as well as their Goblin minions, the new Breakthrough ability. Well this is one brutal Creature for sure. You’d best attack a weak Creature that won’t kill the Berserker first, draw 1 card and then attack a second time with a respectable ATK of 4! And with at least one Orc Warchief in play Berserker will be a 5/3 beast that will have Breakthrough as well. Well so much for the Orc Creatures and the previews of them. The one Orc for which I don’t have an artwork for and hence am unable to present you a card preview yet would be Orc Recruit. He will be a 1/1 with Breaktrough for the cost of 1 Fire Energy. No more, no less. When it comes to support Spells I am running will be Devastating Flames from the Legendary Legacy Expansion, which you can basically cast for free and lets you distribute 5 damage among any number of Creatures and/or Players. It would be best used to get rid of (multiple) bothersome Creatures but can also serve the finishing blow if you opponent is running low on cards in their Spellbook. 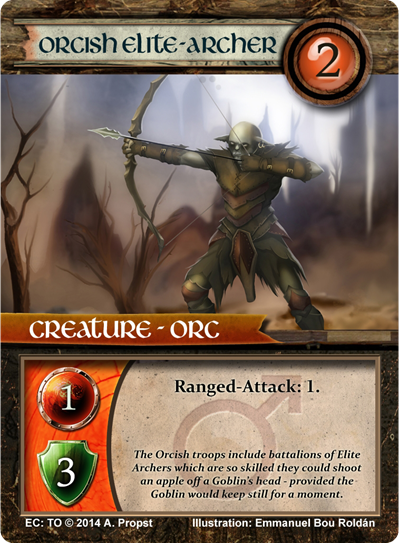 The other two support cards are included in the Orcs Tribal Pack: Orcish Warbanner and Berserk. Warbanner fits the overall plan of rushing the field and attacking for max-damage quickly very well, as it gives all Orcs +2/+0 whilst attacking (and would give all Goblins +1/+0 whilst attacking – but this is irrelevant in an Orc-only Spellbook like this one…) at the mere cost of 1, being a Permanent Spell. The drawback is you’ll have to purge the top card of your Spellbook during each of your Standby-Phases. Still the investment will be worth it by my thinking, since you will want to swing in for the win in as few turns as possible anyways. Berserk on the other hand is a Spell that gives one Creature +3/+0, Breakthrough and Purge whilst attacking, but you have to destroy the targeted Creature after Combat. This is ideal for dealing the finishing blow, and would also be the perfect timing to finally pull off Korlash’s Flip Effect, which would give all your Creatures Purge and a +2/+0 boost until the end of the turn. Provided you were able to field a formidable number of Orc warriors you should be able to swing in for the win early on if you combine the powers of the boosts from Warchief, Warbanner and Berserk combined with yet another terrific ATK boost from your Spellcaster Korlash. The new ability – Breakthrough – will ensure a quick win by bypassing small blockers. Lastly I have to mention that I included 2 Powerstones and 2 Hastestones for additional power and speed. In a mono-element/color Spellbook like this 8 Mars-Stones should be sufficient anyways! 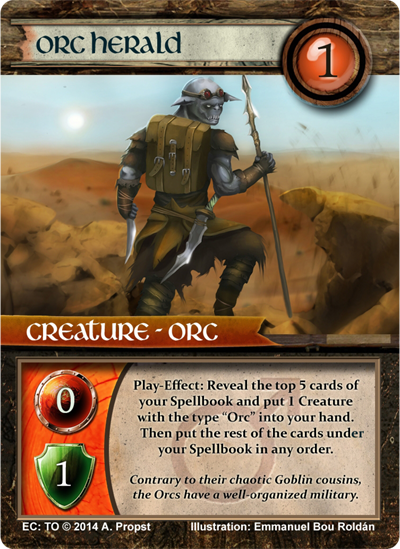 Well, dear reader, dear friend of Elemental Clash, I hope you found the sneak peek at the new Orc Creature type, along with many a card preview, interesting and hopefully, you’ll be looking forward to the first Tribal Pack, introducing Orcs to the Elemental Clash universe, as much as I do. Be prepared for more Elemental Clash awesomeness! !